After spending months and months of designing, creating and putting together our new kitchen, it is finally now time to add the those little finishing touches to make it stand out. Sometimes it feels that adding all those little bits and bobs to it can be just as hard as doing the whole kitchen and as it is such a small kitchen I really needed to think about how I could make the most of the space we did have. 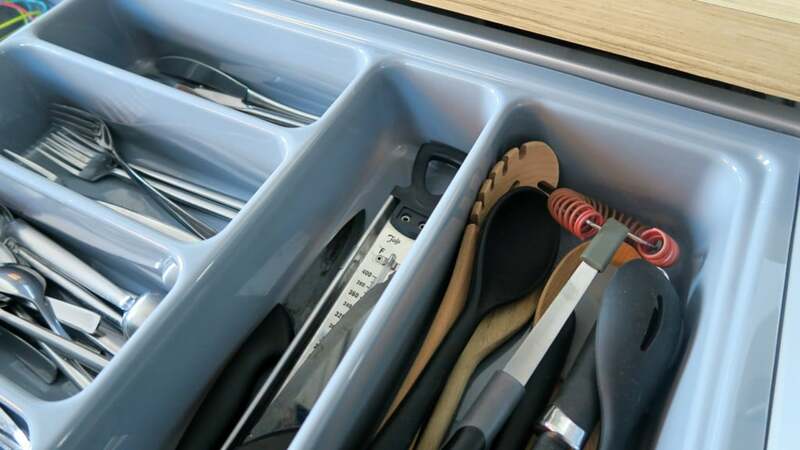 One thing that I have always wanted to have is a really large pan drawer, I wanted to be able to hide away all those pans, kitchen utensils & accessories, along with somewhere to store our plates. Lots of these were previously out on show or hung up on the wall. 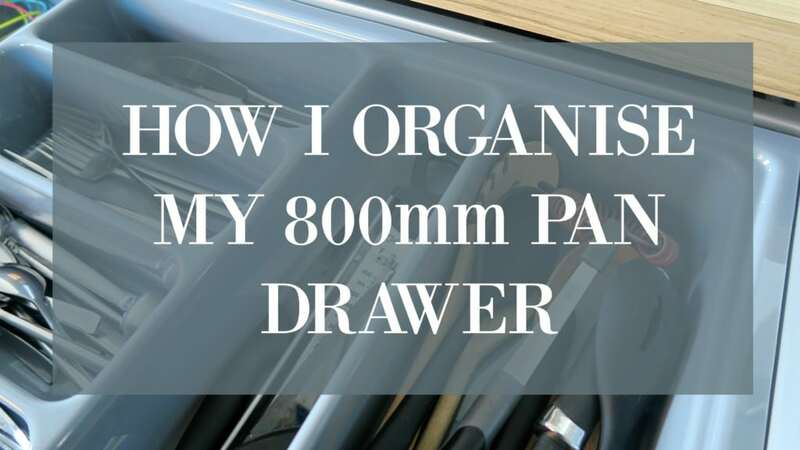 So with this in mind we decided to go for a large 800mm pan drawer, and I LOVE it! 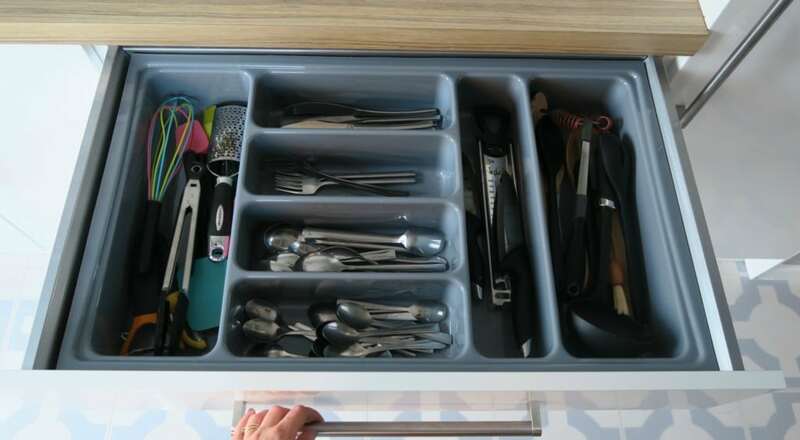 So much so that I even posted on Instagram about how pleased I was with my really large drawer to hold all of my cutlery in! What I really enjoy about decorating (apart from the obvious visual improvements), is that it makes you have a good old clear out of your clutter. Old cutlery and utensils that were hiding at the bottom of drawers and the back of cupboards that, let’s be frank, had seen better days can be replaced with some nice shiny new fresh new ones. I started using silicone kitchen utensils a few years ago and now I use them all the time when baking and cooking. 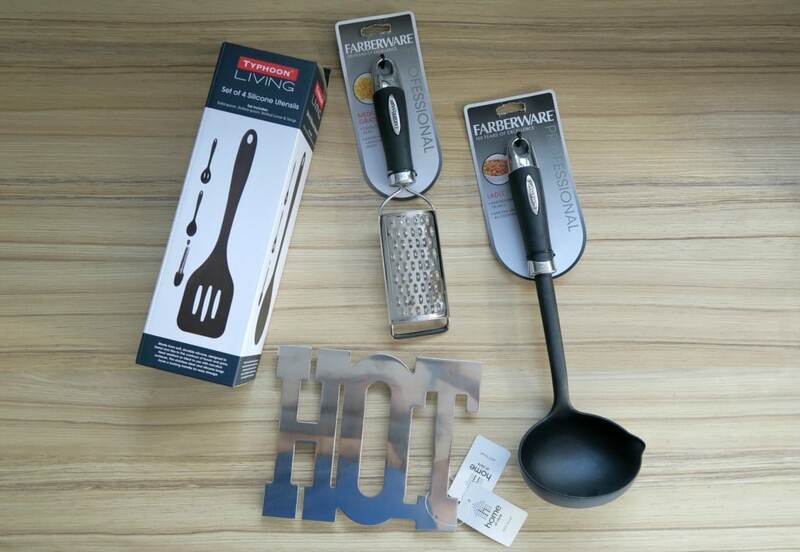 If you haven’t used them before, they are fantastic as they are heat resistant, stain resistant, safe to use on non stick items, and non-corrosive. 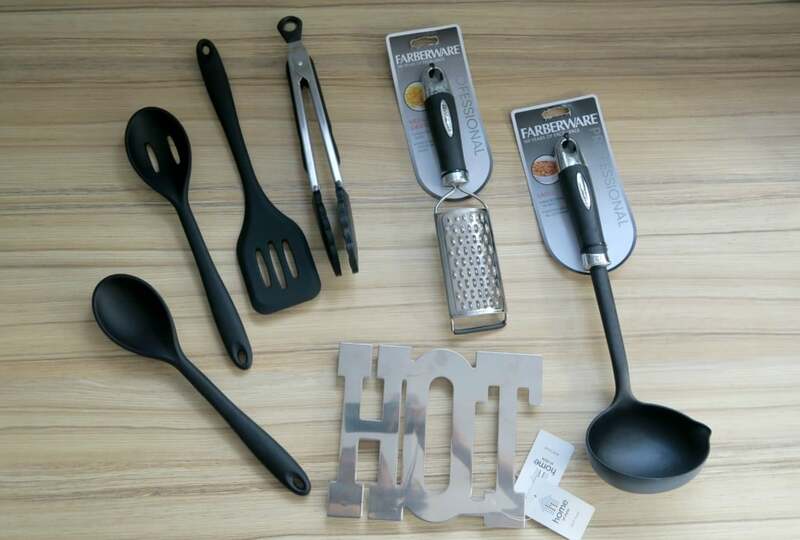 I popped out to do some shopping for my new kitchen and purchased a set of four silicone items, comprising of a slotted spoon, solid spoon, slotted turner and tongs. I also purchased a small grater, rather than getting the large one out pf the cupboard all the time for just a little bit of cheese! A ladle for scooping out meals and a ‘HOT’ sign trivet for resting hot pots on whilst dishing up. This means I can use the larger section of worktop on the other side of the kitchen for dishing up dinners too. 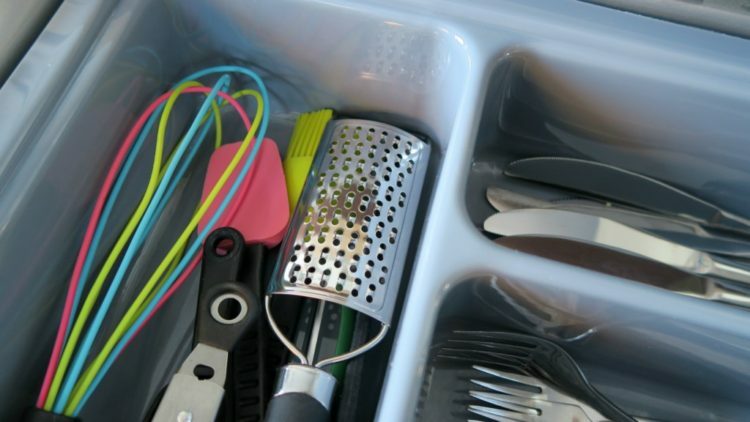 Do you have a large cutlery drawer? I am trying to keep mine tidy, wonder how long that will last?! 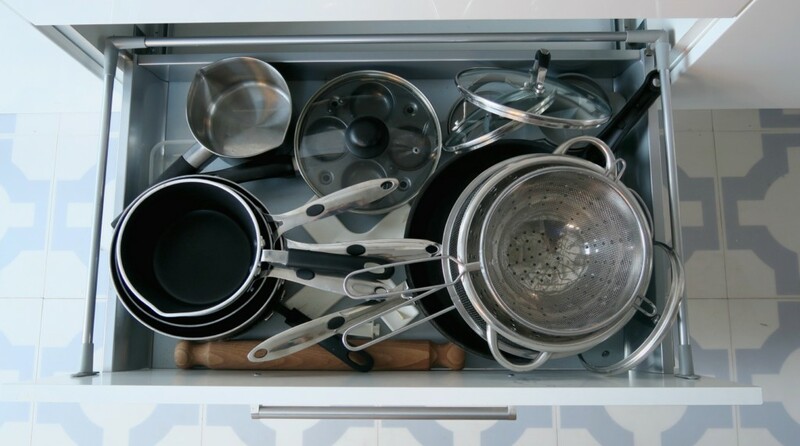 Our large pan drawer has 3 drawers to it, top one I have left for cutlery as it is easy to get to. The next drawer down I have filled with our plates and bowls, the ‘normal’ place to store your plates and bowls is in the cupboards, however we wanted to keep the cupboards we do have for food and cooking items. So what do you think of this design? I love having them in the drawer, they are easy to get to, not trying to move things out the way to get to them, the kids can get to them easily and they are right where I need them for dishing up dinner. Next drawer down is the pan drawer, this is where I can store all the pans. I haven’t sorted this one out properly, they are just piled in there and stacked on top of each other. Does anyone know of a pan system that would tidy this up as I really do need it! These look super organised! Our pan drawer has children’s stuff in lol. I really need to get organised with my draws. They are such a mess at the moment! I have no drawers whatsoever in my kitchen it’s a right nightmare! There isn’t much of anywhere they could go either as it’s such a funny shaped kitchen! I have to say when I get a new kitchen or move house I love throwing all my old horrible kitchen bits out and starting with lovely new pieces. Lovely organising! Yikes, I really need to get my finger out. My draws are awful, the shame!! I need one too! 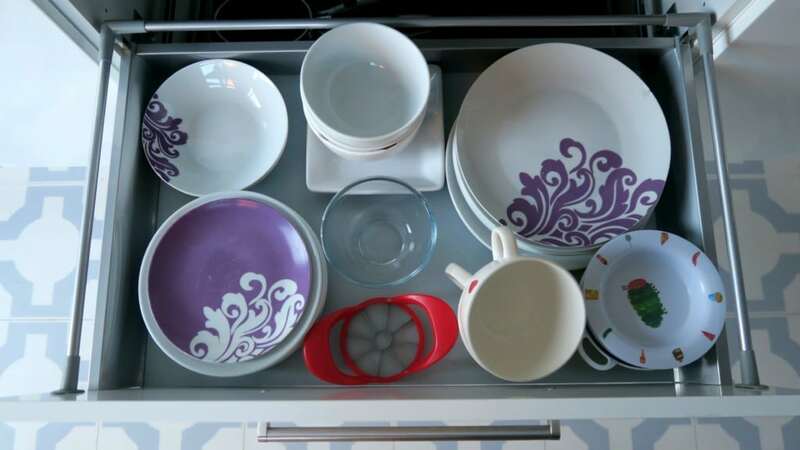 I have to change something in my kitchen and I will start with a new dishwasher machine and reorganize my stuff. Love your idea! I love mine too, but seem to be constantly having to tidy them up. Like you the pan drawer need some kind of system, but I’ve not found one yet. Let me know if you do!